How is it that there are ridges going both north and northeast? I'm neither a geologist nor a Chaos Theory expert, but in nature one can often find patterns on a large scale repeated on a smaller scale. This page thus shows a maps at different scales. Fish hook, north and northeast ridges emphasized. As above, so below. Hopefully, these might give another perspective on the field. 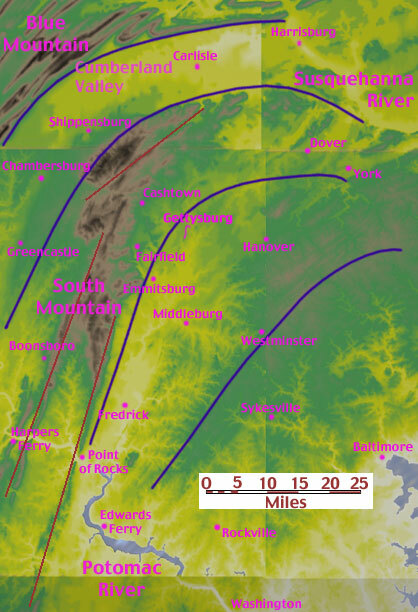 South Mountain is in the upper left of the above map. 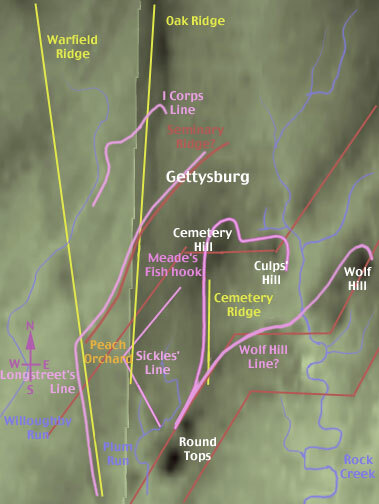 The blue outline around Gettysburg shows the boundaries of the tactical map, below. Note, Seminary and Cemetery Ridges are not major Terrain features, but are only where the armies fought. There are many small northeast heading ridges not visible on the larger scale maps.